Pure Display has developed a wide range of panels that are designed specifically to house spectacles. Our optician displays are developed using the latest technology and materials. By making use of online purchasing, we are able to deliver top-rated display units at the lowest possible price. If you wish to showcase your designer glasses to pique the interest of your prospective customers, we have three broad categories of display units to choose from. This is one of the most budget-friendly ways for displaying spectacles or informing the customers about special deals and offers. It is extremely easy to use and can be mounted on the wall, therefore, making wonderful utilisation of limited space. Our LED backlit posters can be used in the window to attract the attention of the passersby. The posters can be changed frequently. 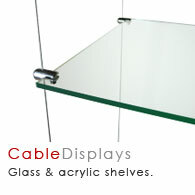 Our Cable Display Poster Sets are available in various poster sizes, from A5 to A1. Additionally, you can also check out A1 Portrait Cable Wire Window Display Set 1, Cable Display Glass Shelving Set 2X3, Acrylic Display Case with Base, Suspended Acrylic Cubes and more. Browse these categories under "Optician Displays"
As one of the illustrious online suppliers of display systems, we maintain the highest standards of quality. 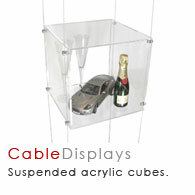 Each one of our display units are made of hardy and durable materials that give our products a rigid structure. All of our products are flat-packed and are very easy to assemble, as well as, dismantle. With the absence of screws, our units come with panels that need to be locked with one another and, therefore, the configurations can be changed, as per convenience. Shop at Pure Display for getting world leading optician displays. If you need anything in specific, feel free to get in touch, with us.